"Gluten-free waffles with a delicate yeast flavor get a crispy and crunchy outside, but are melt-in-your-mouth soft on the inside. They freeze quite well, too. These waffles work with sweet or savory toppings." Approximately 9 hours or the night before making waffles, combine warm water, honey, and yeast in a small bowl. Stir and let rest until bubbly, 5 to 10 minutes. Combine milk and olive oil in a large mixing bowl. Add 1 1/2 cups gluten-free flour, 1/4 cup at a time, mixing well between each addition, to create a thick but pourable batter. Add more flour if batter is too thin, 1/8 cup at a time, until a pourable batter is achieved. Stir yeast mixture into batter until just combined. Cover bowl with a lid or plastic wrap and leave on the kitchen counter all night; batter will double or even triple in volume, so be sure the bowl is large enough. When you are ready to make the waffles, add beaten egg and salt to the bowl with the batter. Preheat a waffle iron according to manufacturer's instructions. Cook about 1/4-cup batter in the preheated waffle iron until waffle is golden brown and the iron stops steaming, about 5 minutes. Repeat with remaining batter. I get approximately 3 cups of batter when I use 2 whole cups of gluten-free flour. 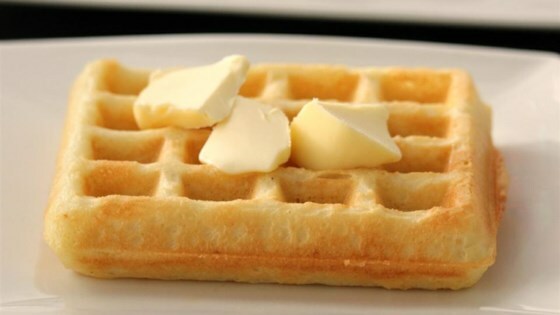 The number of waffles will depend on the size of your machine. Needs a little sugar or honey or something to make it have a little flavor. Otherwise they are really good!